Ravangla : also known as Rawangla or Ravongla - lies between Pelling and Gangtok is a small town situated at an altitute of 7000 ft in South Sikkim district of Sikkim. It is also the starting point for the trek to Maenam Wildlife Sanctuary. Buddha Park : The Buddha Park is situated near Ravangla in South district of Sikkim. It wasconsecrated on 25 March 2013 by the 14th Dalai Lama and features a 130-foot high statue of the Buddha as its centerpiece. The site was chosen within the larger religious complex of the Rabong Monastery which itself a centuries-old place of pilgrimage. Nearby is Ralang Monastery, a key monastery in Tibetan Buddhism and became a stop on the 'Himalayan Buddhist Circuit'. This statue of the Gautam Buddha marks the occasion of the 2550th birth anniversary of Gautama Buddha with the joint efforts of the Sikkim government and its people. The Buddha Park hosts a beautiful statue of Buddha which is clearly visible from all the directions of south west Sikkim. The park area is beautifully landscaped creating ample walkway, gardens and space for visitors to enjoy the serene surroundings having museum meditation centre and for Buddhist conclave . This site commands beautiful views of the mountains and the spiritual ambience of the location adds to the visitor experience. We are proven to be the best taxi service provide in ravangla buddha park Sikkim. 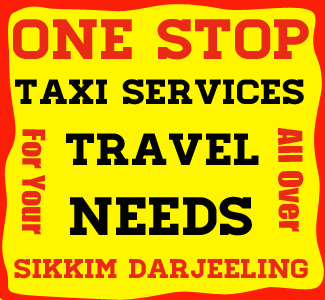 We provide - NJP to ravangla buddha park Taxi Services, Bagdogra to ravangla buddha park taxi Services, Gangtok to ravangla buddha park taxi services fare, Siliguri to ravangla buddha park taxi services, Kalimpong to ravangla buddha park taxi services, Darjeeling to ravangla buddha park taxi services, ravangla buddha park to Zuluk cab rental, ravangla buddha park to Darjeeling cab rental, ravangla buddha park to Kalimpong cab rental, ravangla buddha park to Siliguri cab rental, ravangla buddha park to NJP cab rental. We also provide packege tour over ravangla buddha park. Tourists can reach Pelling easily from NJP Rail Station or Bagdogra Airport or Siliguri Town or Darjeeling or Gangtok. Tourist Visiting Pelling are suggested to stay for minimum 2 nights. First day - tourist can reach pelling from any source. Second day - full day sightseeing of pelling. Third day - Back to their next destination. NJP to Ravangla Buddha Park : 137 kms. Bagdogra to Ravangla Buddha Park : 139 kms. Darjeeling to Ravangla Buddha Park : 73 kms. Due to its advantageous location, many hotels and lodges have come up in and around Ravangla Buddha Park catering to varied tastes and budgets. Indian : Indian tourists visiting Ravangla Buddha Park do not require permit to visit. Foreigner : Foreigners visiting sikkim are provided with only 15 days permit to visit Sikkim which can be extended for a further period of 30 days in two spells of 15 days each. This permit can be easily be obtained through the check post at Rangpho and Melli free of cost. This permits can also be obtained from Indian Embassy at different places. International travellers need to carry original and copies of photograph, passport and Visa. Best time to visit Ravangla Buddha Park is during the months of March, April, May, June, October, Nov. Most of the roads remains closed during the month of July, August due to heavy rainfall and landslides. Also some of the tourists don't prefer to visit Ravangla Buddha Park in the months of December, January and Febrary due to cold climates.